"I would like to thank Secretary Carson for his leadership and partnership in the effort to help those affected by Hurricane Harvey and disaster across the U.S. to recover. "By expanding mortgage relief and including more options to help those struggling to meet their monthly payments, it will take the pressure off and help folks focus on recovery and regaining a sense of normalcy. "I continue to meet with local officials so that we can work together to ensure Harvey survivors are aware of assistance available to them. "Disaster recovery requires coordination at all levels of government and with the private sector to ensure that we are able to move forward and help each other along the way." 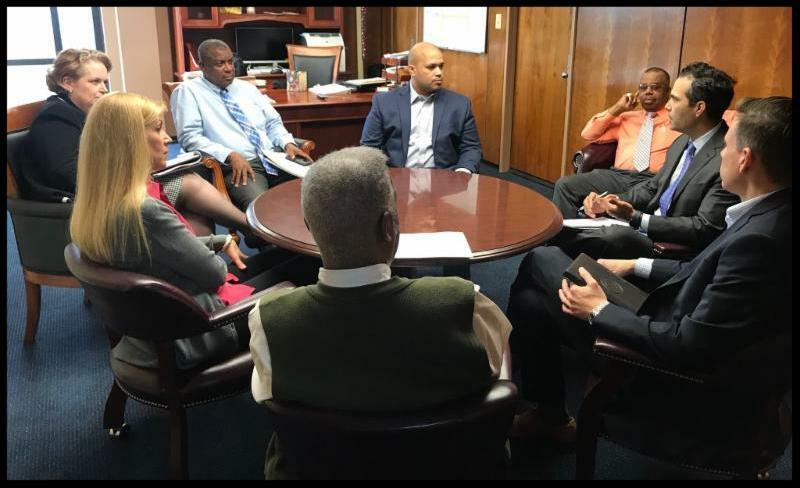 Texas Land Commissioner George P. Bush meeting with Mayor Derrick Freeman about mortgage forbearance in Port Arthur on Feb. 20th. FHA-HAMP option. For more information on the announcement from HUD, please read the HUD press release and FHA's mortgagee letter.